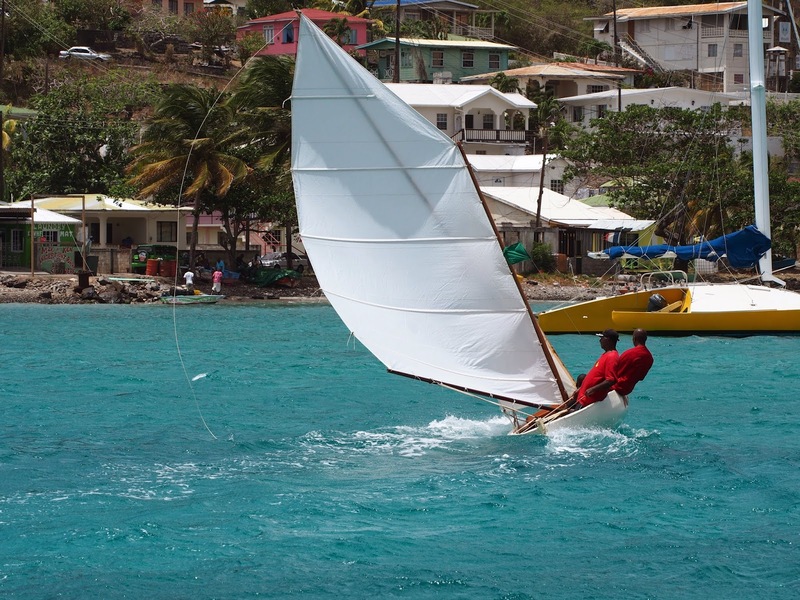 Boats, thumping music and food stalls; it seems that whole of Bequia parties during the Easter Regatta. If you want a quiet holiday then this is the one time of year to avoid this tiny seven square mile island. There are actually two regatta’s; one slightly more sober affair for yachties and the other for double enders of every size complete with man-sized speakers stacked high competing for attention on the shore. 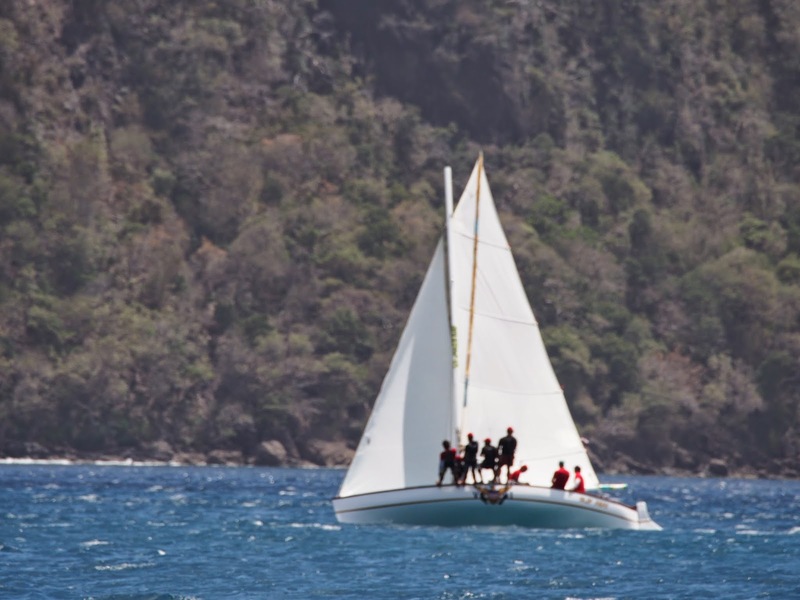 Boats come from far and near to take part but you have to admire the double ender crews who sail 30 miles to windward up from Carriacou with little but the clothes they are wearing and a few dollars in their pockets in a 28 foot open boat! At least the regatta sponsors are generous with clean shirts almost every day and the sea is warm. 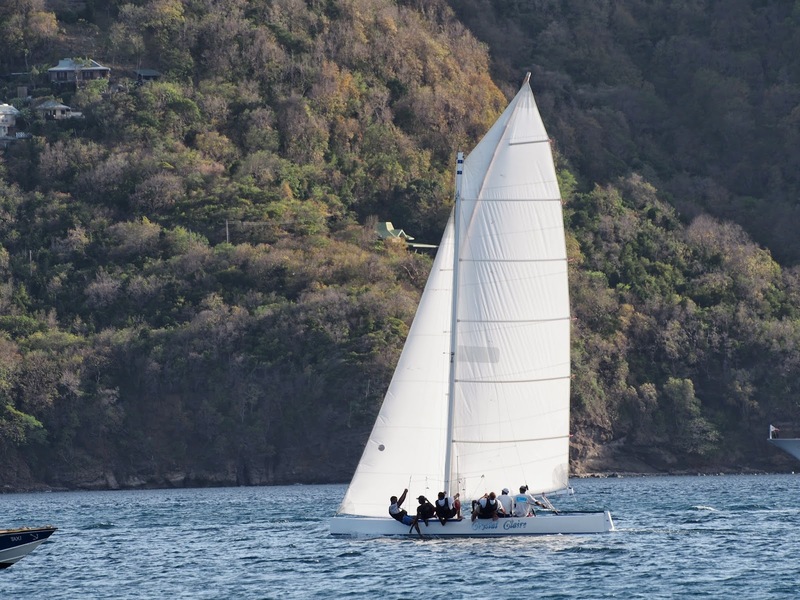 For the new boats Crystal Claire and Slip Away the regatta was adjudged a success, no outright wins but both boats proved competitive against the very experienced crews of Bequia Pride and Confusion. With practise the boats will almost certainly faster on the water and the owners of the older boats are already considering whether to build new boats to ensure they stay ahead. The fleet is competitive but friendly, even the strongest critics from the other crews came to congratulate Chris and Dylan on their achievements over the weekend. Racing a double ender is a unique experience. Firstly there are the starts off the beach, each boat in a class (usually four or five) is launched then held parallel to the beach by the tallest crewmembers with everyone else aboard waiting for the off. The race officer is equipped with a megaphone to count down the time and be heard over the surf. On the shout of “Go” the boats are pointed seaward, jibs pulled in, mains trimmed and the wet crew haul themselves on board. The first leg is usually downwind when starting in Admiralty Bay so no trapeze; just keep the weight low and the boat flat. The main with its huge sprit can catch the breeze high up so soon Slip Away is surfing the waves out towards West Cay, the westernmost point of Bequia. At the point harden up close to the waves breaking on the steep too rocks and round onto a reach to the next mark then it is a long beat towards Petit Nevis off Friendship Bay – do you go in towards the airport on the coast or stay out at sea? 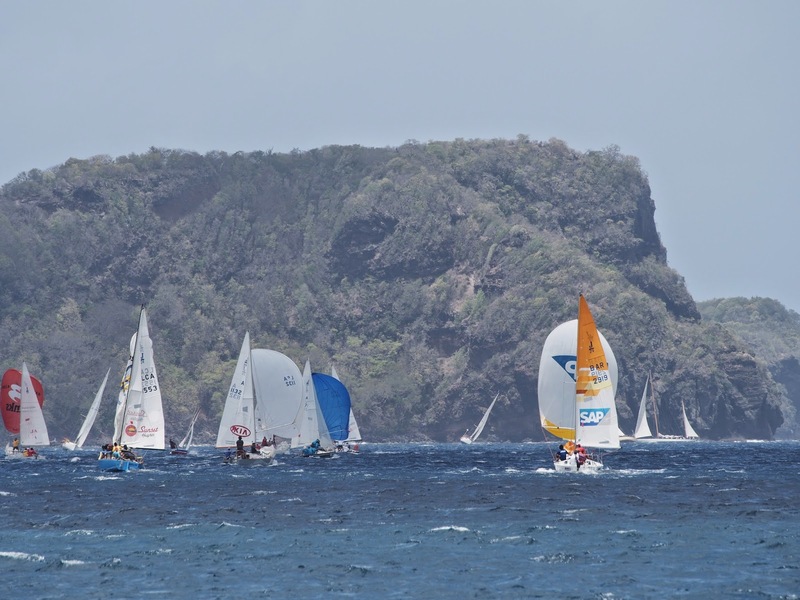 The local sailors on board Shian, Gerrard, young Delray and Lewis advised inshore out of the current running west through the gap between Bequia and the off-lying islands. Beating to windward in an open wooden boat with no added buoyancy is a wet wet experience. If the four trapeze guys aren’t quick enough then leeward side digs in spraying up and more importantly scooping up gallons of water. A double ender can soon become waterlogged. Lori’s almost permanently role was to bail, that was when she wasn’t adjusting running backstays or helping manhandle the traveller up its track. Meredith and I handled the jib sheets during the tacks aided by Delray, the rest of the time we hiked on the side without the aid of trapeze or toe straps to keep us in the boat. Mikko’s height and weight made him ideal for the trapeze where he called sail trim and gusts, Delray sat on the side at his feet, Wayne trimmed the main, a constant task in the gusty conditions and Skipper Dyan managed the helm. By the time we crossed the finish line off the beach at Pagets Farm slipway we were soaked and exhausted but it had been fun despite the breakages.